Home / Rituals / What’s in your pocket? When you were younger and went for walks around the neighborhood by your self, did you notice interesting small stones that caught your eye? Have you ever picked those up and stuffed them in your pocket as they called out to you in a way you could not explain? Have you ever walked along the beach whether along or with a friend and stopped to look at the ocean hitting the shore and just listening to that crashing, mesmerizing sound ? Next you looked down and saw shells or pieces of shells that also called out to you with their shimmery beauty and you slipped them into your pocket. I find a certain fascination with all the small pieces of broken shells I have collected over the year and also for small stones I have collected and more that I have purchased. Lately I have been collecting stones and carrying them in my pocket purposely. They are at first cold when I pick them up but at the end of the day they are really warm to the touch and feel comfy in that warmth. I know sounds a bit weird but stones do have that feeling when sitting in your pocket. Shells I have placed in dishes and jars and have them in my bathroom as that seems a good place for them. I love how they look and feel connected to the waters through them. Shells and bits of them connect me to the watery depths of the ocean. I find peace in my watery depth when I take a long bath and just lie there and let the day’s events wash over me and flow away. Stones as opposed to shells I like carrying them around in my pocket. I feel a little more grounded with that bit of the solid earth accompanying as I travel through my day. Stones and crystals have been around for thousands of years and have a lot of wisdom wrapped up in their forms and structure, would it not be awesome if they could share that with us? What sorts of things from your child walks did you carry in your pocket? Acorns, stones, fall leaves? Monsters, Witches & Pumpkins Oh My! love my brother and something he would say 🙂 these objects become so special to us! Love your appreciation for life and shells, thanks for sharing. 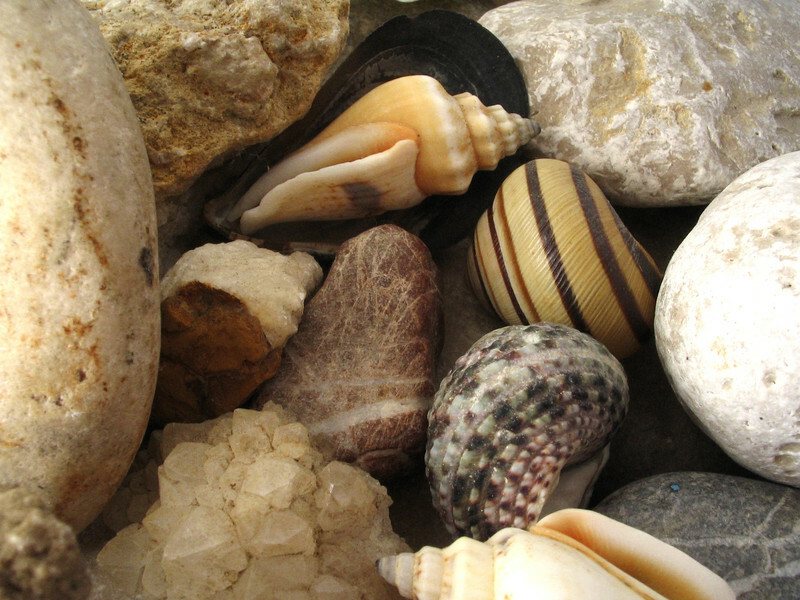 I love rocks and seashells as well. I still have rocks that I collected years ago and a fountain in my front yard full of seashells from a vacation 2 years ago. They remind me of wonderful things my family has done together. Thanks for encouraging me to reflect on that. Wonderful reminders of times past-your fountain sounds like a great idea.